Each statement is part confession and part affirmation, and they are, at their core, examples of a larger strategy behind his poems. His speaker is reaching out, again and again, trying to communicate as plainly as he can. Evans is masterful at challenging his readers to be better readers, at keeping them invested in the poems and the implications behind them, and with each lyrical turn of phrase or declarative statement he’s turning the screws tighter and tighter. 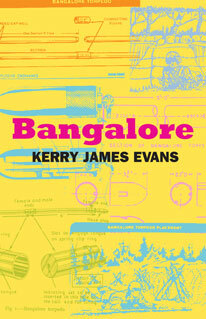 Bangalore is a powerful first offering from a poet who’s clearly got more coming our way, and its bright yellow spine looks especially unique on the shelf, sticking out from the smaller, blander, more conservative books of poetry out there.